Are the pictures from your Canon Rebel DSLR coming out with the lower half of the frame black? 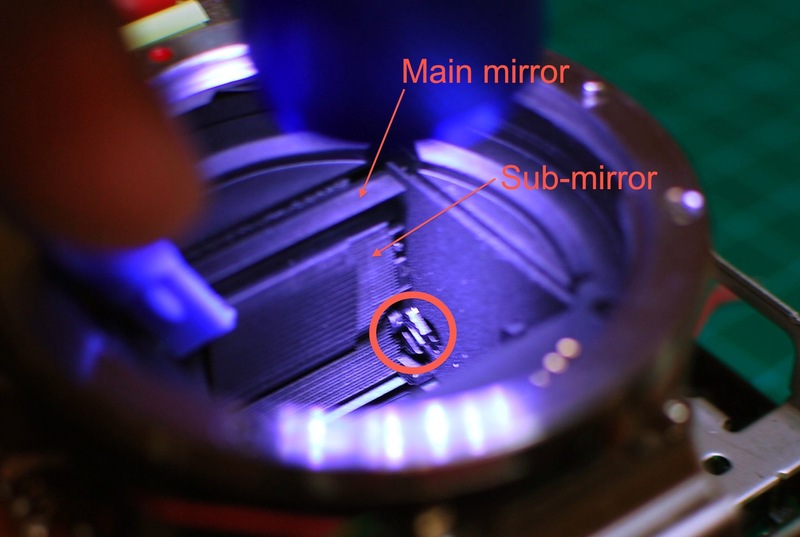 When you take off the lens and push the main mirror up, does the small mirror below the main mirror not lift up completely? If so, your sub-mirror pin is broken and causing the darkness. There is a pin that functions as a hinge for the sub-mirror. When it breaks the mirror does not fully fold up into the main mirror and thus blocks some light to the CCD sensor. 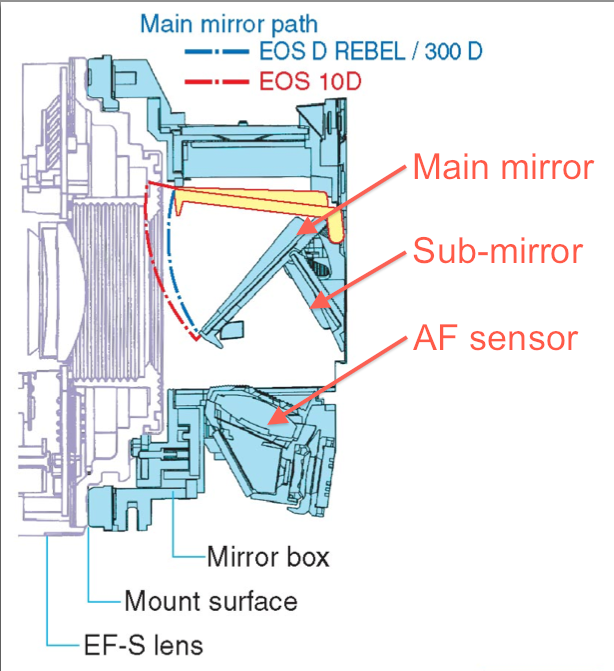 You can manually fold the sub-mirror into the main mirror, which will fix the problem at the cost of your autofocus functionality. In a move of remarkable engineering Canon decided to make a critical high-stress pin out of plastic. Who would have guessed that a tiny plastic pin would break after being flexed 20,000 times? The only way to really fix the issue is to install a new metal pin, which Canon eventually did. There are plenty of guides out there on disassembling the Rebel, google is your friend here. 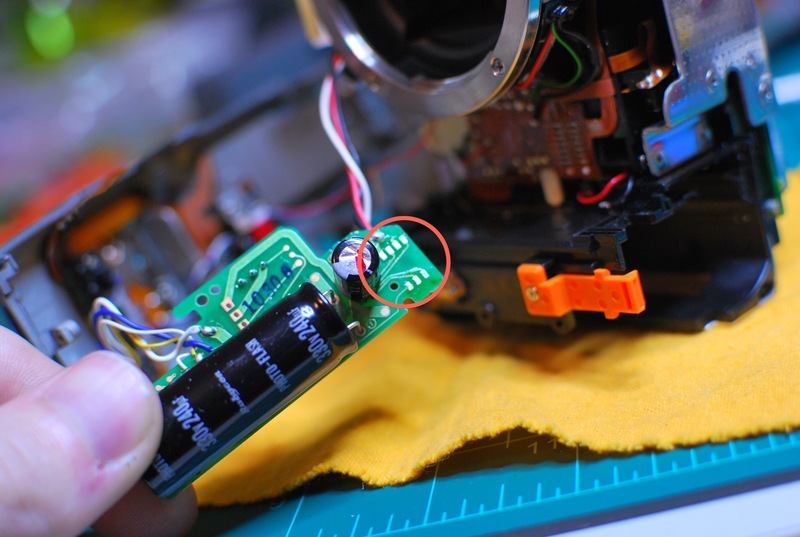 Once you have the front and rear covers removed, take off the top cover, but don’t remove the wiring for the flash. 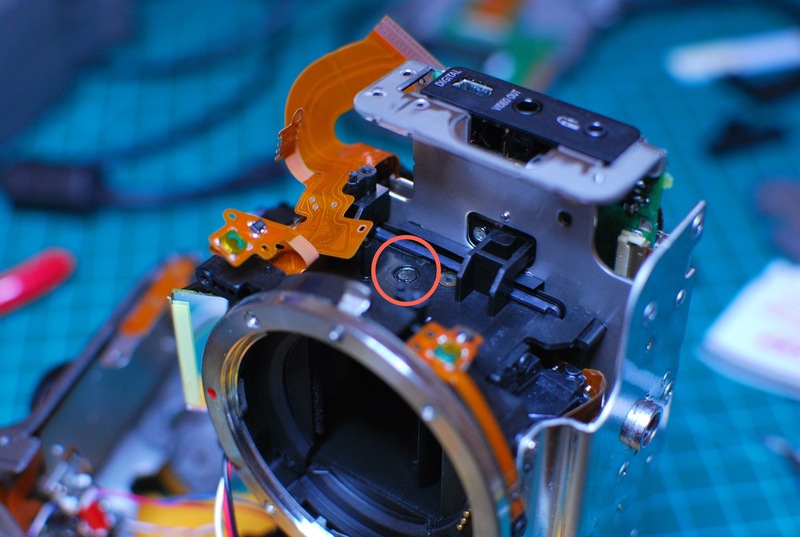 To get to the sub-mirror pin out you need to remove the flash capacitor and PCB on the right side of the camera. Some places will tell you that you can twist the board out-of-the-way without removing the orange ribbon cable. This is ridiculous. It’s much easier to spend 60 seconds desoldering the orange melamine cable, than playing PCB contortionist for 10 minutes. This is where the flex cable attaches to. Remove it and the single screw and the PCB will swing out nicely. Now the pin is clearly visible. 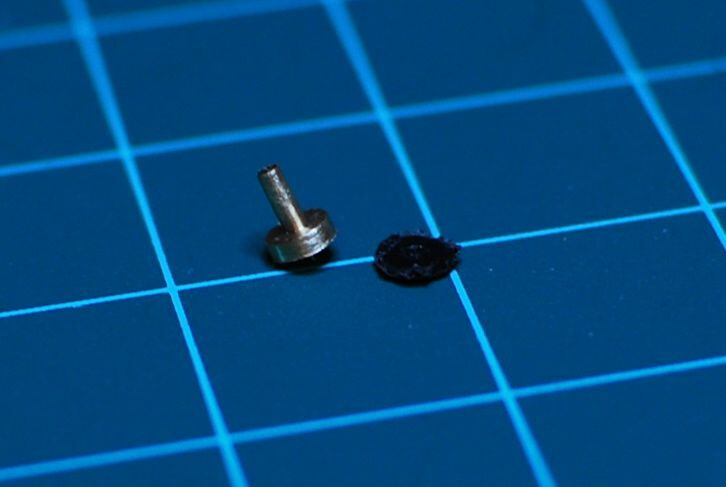 Use a small screwdriver or metal pick to remove the broken pin, it’s glued in from the factory. Based off the hole diameter and the width of the lever that slides on the pin, I machined a replacement from some brass stock. I still have the dimensioned drawing somewhere. I will add it to this post when I find it. Also you don’t really need to machine a new pin, I just happened to have access to a lathe. You can fashion one out of a paper clip if you want. Slide the new pin in, make sure the sub-mirror lever (circled below) slides over the pin. Cover the head of the new pin in epoxy. Avoid using cyanoacrylate (super glue) as the off gassing from it can fog the internal optics.Once the glue is dry test out your new repair. Lift the main mirror up, the sub-mirror should flip-up flush into the main mirror (as above) and the shutter should be completely visible. 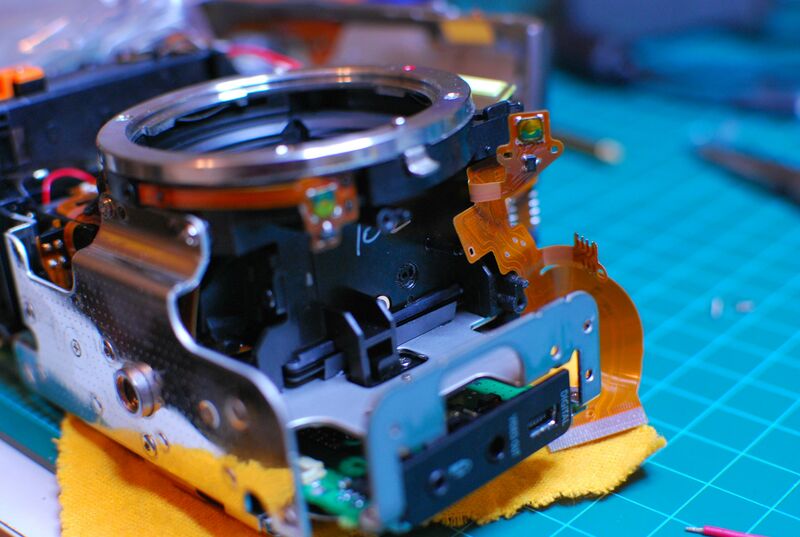 Now just reinstall the flash PCB and assemble the rest of the camera. Your Rebel should be back to normal. Although at this point the Rebel is almost 7 years old. So this is likely just a sign you should buy a new a camera made in this decade. Thanks, I *might* try this. It is great you took the time to put this together. My Rebel must be almost 10 years old and has performed great for many thousands of pictures. I have grown attached to it and $$ are tight now days, so I might try to fix it. what does a sub mirror do? Thanks for posting this. I am on vacation from the US in Ireland, and banged my 10 year old Rebel against a wall and I bet this was the result. I don’t think I want to attempt this kind of fix on the road, but really appreciate knowing what the problem is.